Unique style mens dress shirts are made for men who simply don't want to wear something ordinary and boring. These rich looking mens dress shirts by Daniel Ellissa are the type of dress shirts for the task with their attention on style and attitude. 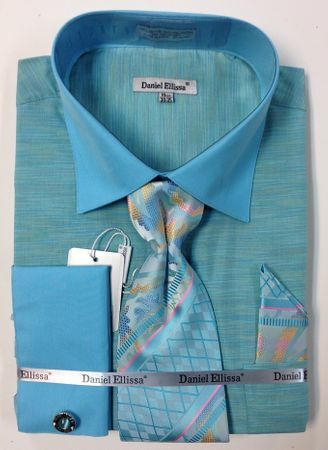 This mint color french cuff shirt and tie set comes just exactly as shown and ready to make an ordinary suit turn into a fashion statement. Made of Cotton/Poly fabric.